Posted on Wed, Feb 1, 2012 : 5:56 a.m. The man credited with founding the Students for a Democratic Society, the movement that came to symbolize the radicalism that swept the 1960s, hasn’t given up the fight. Alan Haber, now 75 and living in Ann Arbor, continues to labor for causes he believes in — from working with Occupy Ann Arbor to lobbying for development of an urban park on the downtown Library Lot on Fifth Avenue, where an underground parking structure is being built. 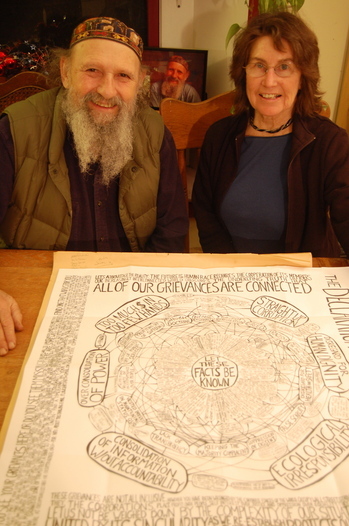 Alan Haber and Odile Hugonot-Haber with a poster from the Occupy movement, inside their Ann Arbor home, located near downtown. The couple will discussing the Occupy Ann Arbor/Wall Street movement beginning at 7 p.m. Thursday at Crazy Wisdom Bookstore and Tea Room, 114 S. Main. While some of the issues have changed from the days nearly 60 years ago when Haber picketed a State Street dress shop (in space now occupied by Sava’s restaurant) that forbid African Americans from trying on clothes, Haber still has the fire. Haber and partner Odile Hugonot-Haber, who has her own history of activism, will be part of a conversation about activism and the Occupy movement Thursday at a Crazy Wisdom Bookstore and Tea Room salon. The SDS was born out of the Student League for Industrial Democracy, founded in 1905 by the likes of Upton Sinclair and Clarence Darrow. The SDS held its first meeting in 1960 on the campus of the University of Michigan, where Haber had been a student since 1954. But that didn’t stop Haber: He had protested when three U-M professors had been fired for refusing to sign a loyalty oath and picketed Ann Arbor Woolworth’s and Kresge’s stores for refusing to serve African Americans in the Jim Crow south. And he founded the SDS. But Haber would come to learn another lesson that would repeat itself years later: There could be dissent and factionalism. By 1969, after Haber had moved to Berkeley, Calif., SDS splintered with the Weather Underground faction turning to violence. “The movement turned very hard edged,” Haber said. For the next 25 years, Haber lived in Berkeley, earning a living as a woodworker, founding a collective called the Splinter Group and living as what he calls “a freelance radical intellectual.” It’s also where he met Hugonot-Haber, an activist who was part of the 1968 uprising in Paris and had demonstrated against apartheid and worked for the homeless in Berkeley. They returned to Ann Arbor in 1993 when Haber’s ailing mother needed care. They found causes in Ann Arbor, but the fever of the 1960s was gone. “I was amazed that so few people in this city are involved in politics,” Hugonot-Haber said. “It’s a bourgeois town.” She tried to organize demonstrations in favor of a single-payer health care system. It fizzled. “People weren’t motivated,” she said. Haber looks at the practical side. Much of Ann Arbor works at the U-M, which offers health insurance. The couple became active in the Occupy movement last fall when Hugonot-Haber met two young visitors who were the first to occupy Liberty Plaza in downtown Ann Arbor, a park Hugonot-Haber calls “the living room for the homeless.” Students and the homeless came together to occupy the space. Ultimately, the couple said, Occupy Ann Arbor fell victim of splintering groups. Haber summed it up: “There was difficult interfacing between activists and homeless.” Things grew petty with who would clean and straighten the tents, he said. These kinds of “human relations/cross classness” issues will be discussed at Crazy Wisdom Thursday night, Haber said. The campsite in Liberty Plaza in downtown Ann Arbor. 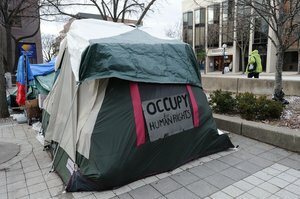 Occupy Ann Arbor wasn’t for naught, the couple said. They are behind a proposal for a 24-hour warming center for the homeless in Ann Arbor, although they haven’t found space for the project. While the 1960s became known for activism, Haber said he believes there’s less apathy among young people today. “A lot more people know what’s going on, kids are more aware of the hypocrisy,” Haber said. But economic realities - students are focused on the high cost of their education - make it harder for students to become activists. “I paid $50 a semester, now it’s more like $12,000 a semester,” Haber said. “We used to say activism is a five-year undergraduate course.” Is he disheartened? He won’t say. “We (in the 1960s) put out a vision of inclusion and that vision got shattered. Now, students pick out one thing that they can work on usefully. Direct action - demonstration and confrontation - ended in the ‘60s. That form of activism exhausted itself,” he said. Thursday’s discussion at Crazy Wisdom, 114 S. Main, begins at 7 p.m. Click here for more information. Fri, Feb 3, 2012 : 1 a.m.
Once a commie ..always a commie !!!! Peace love dove you groovy freaks . Thu, Feb 2, 2012 : 2:33 p.m.
Part of the reason it's hard to motivate people on the single-payer system is that older people tend to be more active politically--at least in terms of voting. If you're over 65 you have a single-payer socialized medicine system that works quite well called Medicare. When you're already covered, it takes away personal motivation to be active. Just like in the 60s when people would get a high draft number, it removed their motivation to protest the war. Thu, Feb 2, 2012 : 2:05 p.m.
Thu, Feb 2, 2012 : 12:03 p.m. While their protests in the 50s and 60s were for noble causes, I have a hard time stomaching professional protesters and found it highly entertaining that the activists and homeless would not see eye to eye on handling something as trivial as housekeeping duty. We all do things we don't want to, either because it is the right thing to do or we know of the benefits and consequences. As another poster astutely pointed out this is a micro version of what is wrong with the Occupy &quot;movement&quot;. Everyone has a high opinion of their own worth and nobody wants to get their hands dirty. Start somewhere, work hard, and work your way up the ladder. I am the 99% and the Occupiers do not represent me. Thu, Feb 2, 2012 : 9:32 a.m.
Ah, yes, the SDS. One of the most sexist organizations ever created. Nothing to celebrate there. Thu, Feb 2, 2012 : 4:29 a.m.
Thu, Feb 2, 2012 : 3:31 a.m.
Thu, Feb 2, 2012 : 2:37 a.m.
All this talk makes me hungry for Hippie Hash at The Fleet!!! Thu, Feb 2, 2012 : 2:32 a.m.
your quote made me laugh...&quot;Things grew petty with who would clean and straighten the tents, he said. These kinds of "human relations/cross classness" issues&quot;.....sounds like coping with being part of a family living in a home, ironic isnt it. Thu, Feb 2, 2012 : 12:08 a.m.
Keep up the good fight Alan..
Thu, Feb 2, 2012 : 2:50 p.m.
so i am. and there is a new day coming. many hands make lighter work. join the discussion. Wed, Feb 1, 2012 : 11:47 p.m.
Rebels without a clue or cause living in the most just society in the history of the world. It must be difficult to view yourself as morally superior when obama is in the White House and the liberal left is collapsing the US standard of living. I am curios how folks like these would stand up to questions about their view of America and basis for constant complaining. ....I would love to find out - my guess is both of us would be greatly amused. Thu, Feb 2, 2012 : 1:17 a.m.
Yep, liberals always out to destroy the country. So tired of hearing this. Yeah, I know what you'll say next I should move because I don't love everything about my country. A true patriot questions nothing. Wed, Feb 1, 2012 : 4:48 p.m. The historical reference to the League for Industrial Democracy is distorted. The LID was founded by Upton Sinclair and Walter Lippmann on the British model of the Fabian Society (which sought to be the think-tank of the Labour Party). In the popular front era of the mid-thirties, its college wing, the SLID, was one of a number of groups that merged to form the American Student Union. The ASU was captured by the Communist Party USA and declined, with the illusion of a common cause between Communists and democratic liberals destroyed by the Hitler-Stalin Pact that started World War II. In the late 1940s, the LID relaunched the SLID. Its constitution included an explicit prohibition of membership by totalitarians, which was meant to exclude all flavors of Communists, from the Stalinists of the CPUSA to the various Trotskyite splinters (I was there). In 1960, the UM Chapter of SLID discarded the anti-totalitarian restraint and became SDS. Wed, Feb 1, 2012 : 5:40 p.m.
i meant to say, slid never had a chapter at the university of michigan in in the time i was a student, from 1954. in the late 40s i was told there was a large slid group, but it succumbed to maccarthyist repression, and by 1954 where were no &quot;left&quot; organizations at all on campus, leading to the formation of the political issues club and an open forum approach to political education, learning, and action. Wed, Feb 1, 2012 : 5:24 p.m.
happy to have some further information into the discussion, the information i got, from harry laidler, who was a student at the time, was that the founding energy in 1905 was upton sinclair, jack london and clarence darrow. what i call indigenous american radicals. walter lippman came later, as did the alliance with the fabian society in england. we still distributed fabian pamphlets when i was in the national office. slid never had a chapter at the university of michigan. the political issues club was our local independent group, needed again. and sds, which took that name in 1959, did not drop that exclusion clause and maintained its anti totalitarian commitment to democracy, as a means and a social goal, in all phases of our common life. Wed, Feb 1, 2012 : 5:18 p.m.
an erudite post, as usual . Wed, Feb 1, 2012 : 3:57 p.m.
from the article: Ultimately, the couple said, Occupy Ann Arbor fell victim of splintering groups. Haber summed it up: "There was difficult interfacing between activists and homeless." Things grew petty with who would clean and straighten the tents, he said. These kinds of "human relations/cross classness" issues will be discussed at Crazy Wisdom Thursday night, Haber said. this stuck out to me, so you mean that some people were wanted to clean and straighten the tents and some didn't want to? Some were willing to and some were not? some expected everyone to do it and some expected just some to do it? Seems to fall in line with those that want to do for themselves and some that want others to do for them. This is a micro example of the whole thing. You have the Little Red Hens and those that just want some of the bread after it is made. Wed, Feb 1, 2012 : 11:04 p.m. Wed, Feb 1, 2012 : 10:03 p.m.
And here we see it., that age-old contrast in views. The idealistic liberal thinks that the human being is inherently good. The realistic non-liberal knows that the human being is, well, not, and that plenty of us would be more than content to be able to sit back and be provided for, or do even worse things. And the truth is there right in the article. Part of Haber's own SDS movement became the Weather Underground and &quot;turned to violence.&quot; Haber euphemistically says that they became &quot;hard edged,&quot; because his philosophy can't embrace the truth: they became evil. I'm with Bunny. Wed, Feb 1, 2012 : 7:49 p.m.
i don't know what monastery bunny is abbot of, but in the real world of diversity, class and race differences, injustice, injury, accidents and angers, some relationships take time to develop. this isn't over. don't be too quick to put your stereotypes, projections and bad attitudes on other people and situations. when bunny said: so you mean... no that is not at all what i mean. bunny completely misunderstands and put her/ or his negative view of human nature on a much more interesting and complex situation. bunny's loss. Wed, Feb 1, 2012 : 5:52 p.m. Wed, Feb 1, 2012 : 3:56 p.m. So, how about some appreciation for these &quot;crazy libs&quot; that fought for the rights of Americans to utilize stores and shops the same way their neighbors do? Maybe you don't agree with everything they stood/stand for, but can we at least agree that fighting for the equal rights for all races is a GOOD THING!? Wed, Feb 1, 2012 : 4:10 p.m. I can completely agree with that. Good point. It would be really enjoyable to one day see comments discussing the ideas presented in an article and not just doing character assassination of the person with the idea. Thu, Feb 2, 2012 : 5:32 p.m. Wed, Feb 1, 2012 : 5:04 p.m.
gramma definitely gets to the point. to discuss the ideas presented in an article. fortunately, not having thrown in the towel, i have something with which to wipe away the splatter from some of the comments. that an article simply announcing a salon discussion led by a couple of old activists at crazy wisdom tomorrow should evoke such derision, makes me wonder how dumbed down has our democracy gotten. i hope for a good discussion, the public is invited. the big question is, will humanity survive this greed dominated convergence of social, political, economic, ecological crises, or will the consciousness and will grow toward a conscious social evolution, away from the war culture, racism, materialism, and militarism, into the peace culture, of non-violence, caring sharing helping healing, etc. the littler question on which we will focus is the occupy movement. the 99%, the 1%, where did this come from, what's happened and going on now, who are you and how to join, are all parts of this question. other activists besides ourselves have been invited and will contribute top the discussion. Wed, Feb 1, 2012 : 2:06 p.m.
Well, good thing they did not model their movement on a bunch of people that dressed in costume , attacked private property and tar/feathered people! The hatred and misinformation spread on these pages boggles the mind. Wed, Feb 1, 2012 : 5:51 p.m.
Love this, clownfish. I would venture a guess that most people don't know what you're talking about. Wed, Feb 1, 2012 : 1:38 p.m. Wed, Feb 1, 2012 : 2:36 p.m. Ever check property values in those places you find so reprehensible? &quot;The Market&quot; says they are some of the best places to live in the country, and the &quot;bottom feeders&quot; obviously make enough scratch to be able to live in those fun places. I wonder if letting African Americans try on clothes should fade into history, or allowing black kids to use the same drinking fountain and white kids should fade off into history? Maybe allowing COINTELPRO to re-organize is a good idea, along with putting PCB's back into our milk, putting some more lead in our gasoline and paint would make you happy? Wed, Feb 1, 2012 : 1:25 p.m. I'll bet his theme song is &quot;Glory Days&quot; by Bruce Springsteen. Someone needs to tell the old fellow that the parade has gone by. Wed, Feb 1, 2012 : 1:20 p.m. Wed, Feb 1, 2012 : 5:49 p.m. Wed, Feb 1, 2012 : 4:22 p.m. Wed, Feb 1, 2012 : 1 p.m. The writer confuses &quot;throwing down the gauntlet&quot; with &quot;throwing in the towel&quot;. the first refers to challenging someone to a duel by throwing down a swordsman's glove ( or smacking them in the face with it) ; the second to surrendering . Wed, Feb 1, 2012 : 12:40 p.m.
&quot;She tried to organize demonstrations in favor of a single-payer health care system. It fizzled. "People weren't motivated," she said. Haber looks at the practical side. Much of Ann Arbor works at the U-M, which offers health insurance. &quot; Maybe the people of Ann Arbor like 70% of Americans do not want single payer socialized health care. I don't understand why they have to call it the Occupy&quot; movement; why not just be straightforward and call it the we want your money to be ours movement. You want something to protest? You should march on the universites and demand all of the overpaid professors take a pay and benefit cut instead of asking the government (all of us taxpayers) to help out. Your protests of the blatant discrimination that used to occur is admirable, most of your other causes appear to be misguided. @Mike A little knowledge is a dangerous thing. First of all, Faculty are not federal workers. 98% of Michigan faculty have advanced degrees (PhDs, MDs, JDs), they are not government office workers. You need to compare the salaries of law school Profs with counterparts in corporate or tort law. Compare Med School Prof. with physicians in private practices. Compare Business School Profs. to executive in management or finance. Compare Engineering Profs. to those in high tech industries. To compare Michigan faculty to &quot;federal workers&quot; shows that you do not understand who we are or what we do. Thu, Feb 2, 2012 : 3:34 p.m.
Thu, Feb 2, 2012 : 12:58 p.m.
Mike you are correct the majority of Americans do oppose single payer system. Socialize medicine doesn't work in any country. Our stab at socialize medice (medicare/medicade) is a complete bureaucratic mess that is unsustainable. The problem with socialized anything is you eventually run out of other peoples money. As we can see by looking at the European Union today. Thu, Feb 2, 2012 : 12:51 p.m.
Alan: - There are plenty of polls which show the opposite of what you linked. For example: <a href="http://www.healthcare-now.org/another-poll-shows-majority-support-for-single-payer/" rel='nofollow'>http://www.healthcare-now.org/another-poll-shows-majority-support-for-single-payer/</a> (59% [of Americans] say the government should provide national health insurance) <a href="http://www.huffingtonpost.com/2009/06/17/obama-boost-new-poll-show_n_217175.html" rel='nofollow'>http://www.huffingtonpost.com/2009/06/17/obama-boost-new-poll-show_n_217175.html</a> (NBC/Wall Street Journal Poll - showed ~75% backed the public option) ...and so on. Wed, Feb 1, 2012 : 5:47 p.m. Wed, Feb 1, 2012 : 5:34 p.m.
What makes you think we are overpaid? Actually most of us could probably make more money in the private sector. The faculty here at the U of M are what make the institution, we bring in close to 1 Billion dollars, we generate the prestige, the research, the intellectual capital, and the innovation that led the Sunday Times of London to rate Michigan 15th in the WORLD! Just think what the economy in Ann Arbor would look like without us? Wed, Feb 1, 2012 : 4:19 p.m.
i think mike has is numbers downside up. its about 70% of the people who favor some kind of single payer/ get the profit out of health care system. even among hospital administrators. like the people who say:don't let the government touch my medicare. because workers in the university health care system negotiated a good benefit package with the &quot;employer&quot; they are less motivated to demonstrate for the good of others, but many do, all the same. billionaire insurance companies and drug companies, and the few politicians whose elections they help buy, are what stopped consideration of single payer, not public apathy. maybe mike should come to the discussion, and listen some to what the &quot;occupy movement&quot; is about, it is certainly not, &quot;we want your money to be our money&quot; but it is about economic justice and fairness, honest pay for honest work, and even putting rip off banksters in jail rather than fronting them bail. one of my other causes is there should be a warm place in ann arbor for anyone cold in the winter. warmth is a human right. is this misguided? or is it your view mike: &quot;let them freeze&quot;? Wed, Feb 1, 2012 : 12:15 p.m.
Wow, this lede is amazing. To &quot;throw down the gauntlet&quot; means the opposite of what you think it means. Thu, Feb 2, 2012 : 2:27 p.m.
Alan, I'm pretty sure everybody assumed it was the writer of the article who misused that phrase, not you. I think it's safe to assume that, considering the number of trips you've made around the sun, you're familiar with just a few more figures of speech than an AnnArbor.com blogger. Wed, Feb 1, 2012 : 10:07 p.m.
To mr. Haber's response to this comment: Well, while i don't subscribe to his blanket rote-speak litany of supposedly anti 'peace/love/bliss' accusations he hurls at pretty much everyone &quot;post 5000&quot; years ago, i appreciate that he is at least not pinning it all on the &quot;west&quot; ( while ignoring the equally or even more nasty other regions of the world) And he's not totally off base in that time frame since it was the adoption of agriculture as the mainstay of most human survival ( between 10-6000 years ago , depending on area) that marked the rise of populations and stratified societies, which in turn led to more social inequality and warfare...although earlier / later hunter gatherer societies were hardly inevitable &quot; communal paradises&quot;, as any good anthropologist/archeologist could attest . ( e.g. the homicide rates of the kalahari san /&quot;bushmen&quot; approximate those of inner city city america , adjusting for relative size...and there were few to no pacifists among native americans, pre or post columbus, at least that survived their neighbors very long . .
@cindy. I apologize, my comments might seem a little harsh to annarbor.com staff who I believe are doing the best they can with what they have. The rest of the article is pretty good. Thanks for being responsive. Wed, Feb 1, 2012 : 3:58 p.m. Wed, Feb 1, 2012 : 2:32 p.m. Thanks everyone for your feedback. The first paragraph has been recast. Wed, Feb 1, 2012 : 2:21 p.m. In case someone from annarbor,com is reading, let me amend my comment. The site would have to get substantially worse before I would stop reading it. Because it's the right price for what you have to offer. In me you have a set of eyeballs you can sell to advertisers. Fair deal. But I wouldn't subscribe/donate to your site, as I do at another Ann Arbor news web site which produces high-quality, well-researched, well-written local news, albeit not on a daily basis. I'm sure you know which one I'm talking about, their editor used to work at the Ann Arbor News when it was a real newspaper. Yes, it's true, I voluntarily pay for quality journalism, which they offer for free. Out of gratitude that someone picked up the ball after the demise of the Ann Arbor News. Wed, Feb 1, 2012 : 1:50 p.m.
As recent as 5 years ago there would have been someone we used to call an &quot;editor&quot; who I'm sure would have caught this. These days I'm left to speculate whether annarbor.com isn't willing to pay for a good one, or maybe they simply don't have one at all. Maybe they calculated it doesn't really matter to their bottom line. How good does their &quot;product&quot; have to be anyway? Wed, Feb 1, 2012 : 1:42 p.m.
Amazing, isn't it? Every day I read this blog I lament the loss of professional journalism in Ann Arbor and the rest of the country.